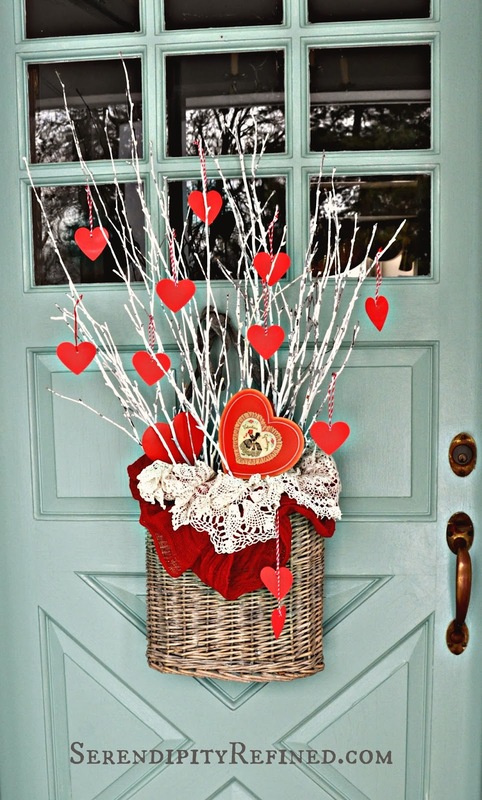 The Valentine's day decor on my front door this year may look familiar. 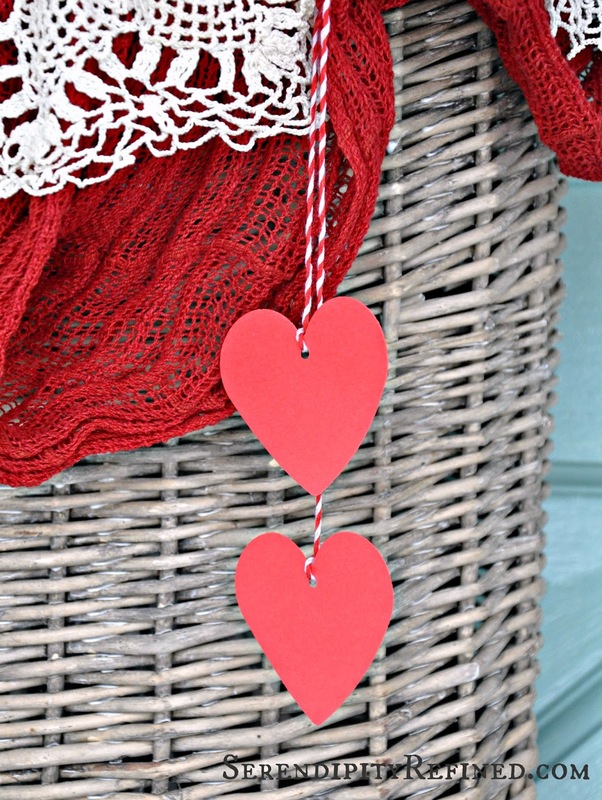 Well, that's okay because today I'm going to show you how I made it using oa basket, white painted branches, and red paper hearts that I already had on hand. 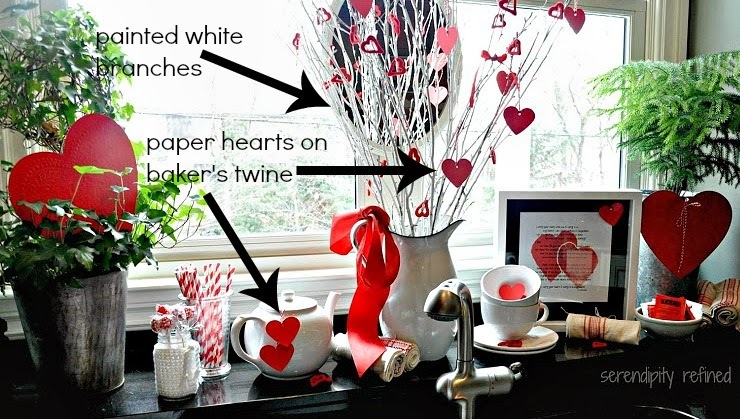 It's a photo of Valentine's Day in my kitchen last year with a free printable of one of my favorite poems. I'll bet that you're beginning to notice a couple of similarities now, aren't you? How about this photo from my French country farmhouse dining room makeover (here)? I used the same French flower gathering basket. 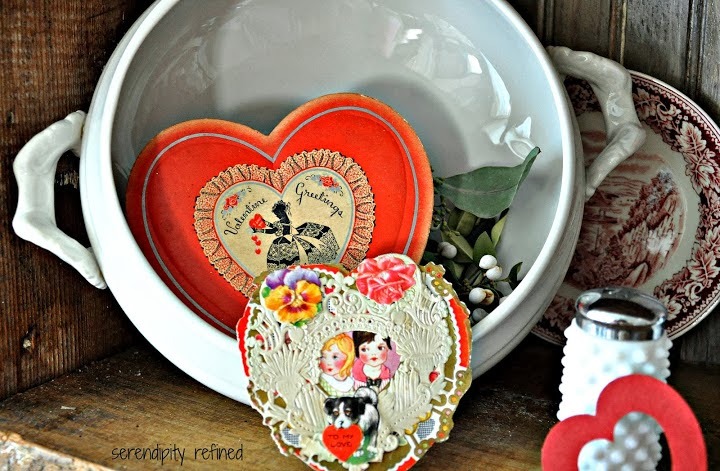 You've probably also seen the vintage candy box. 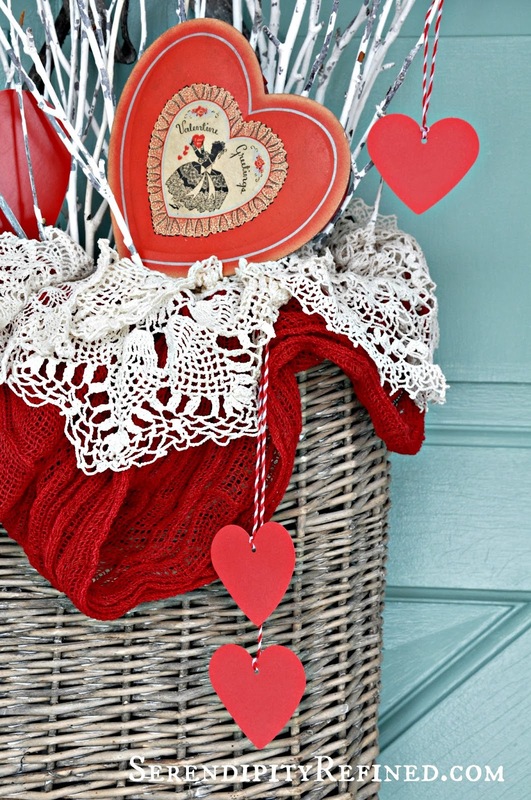 It's below in my 2013 Valentine's day dining room decor post (here). Between downsizing when we moved to the French Farmhouse last August (the farmhouse is roughly 1/4 the size of our former home) and saving money for Phase 2 of the renovation, re-using what I already have on hand has become a priority as well as a necessity. 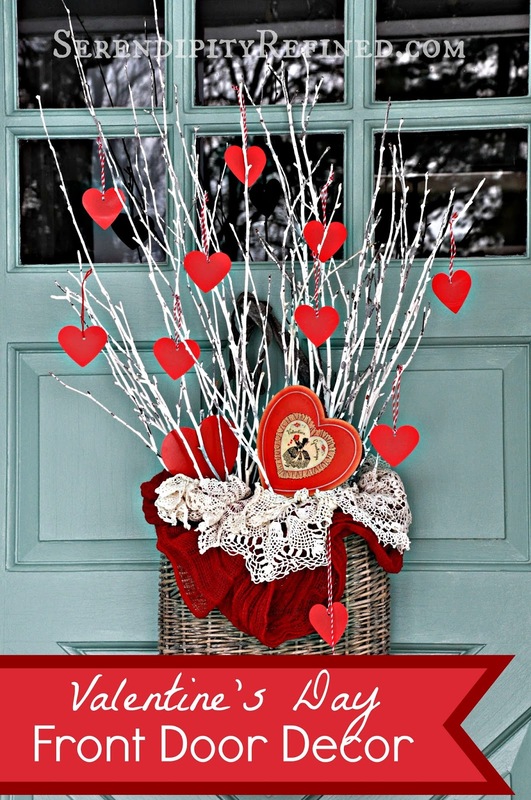 All you need to do this on your own front door is a wicker basket (a canvas tote bag would be cute, too), a bunch of branches painted white (or red twig dogwood branches), Hearts cut out of card stock and strung on baker's twine, a few old doilies (or lace) and a piece of red fabric (or a red scarf) and an optional red heart candy box (or a larger heart cut out with a paper doily glued to it). 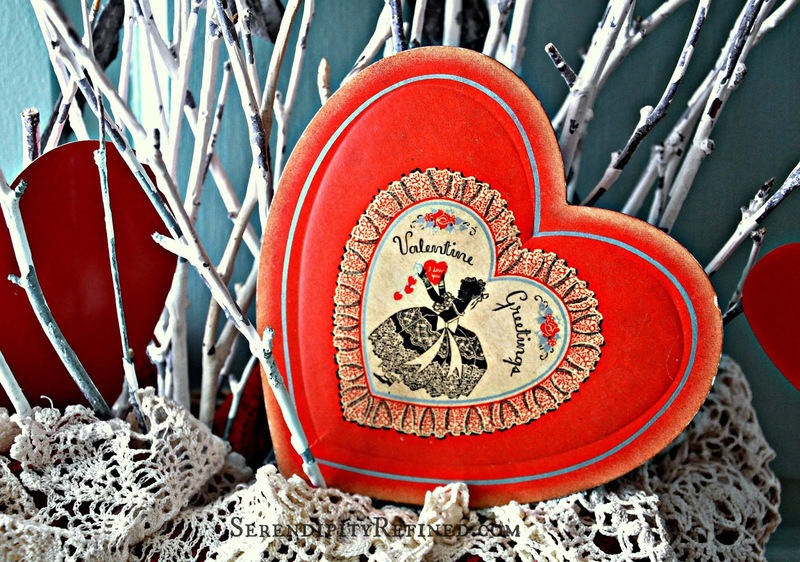 except maybe chocolate...I like chocolate more than darned near anything.